What’s better on a Sunday afternoon that a little Sondheim? Sorry, I’m getting ahead of myself. A common trick for a producer wanting to create a small cast musical is to take a collection of a composers songs, ideally those unfamiliar to an audience (such as songs cut from other musicals and not easily available), arrange them together into a show, and hope it works. Sometimes, if that producer is lucky, they can create a through theme and perhaps a modicum of a story. If a producer is really good, and the songs are really good, they can come together and form something with a distinct identity that can succeed on its own. That’s what happened with Marry Me a Little, created as an off-off-Broadway review back in 1981. Now, if you combine that with great direction and performance, you can get what I saw this afternoon: an instantiation of such a musical that can make you forget the sources of the previously little-known songs (that are now well known thanks to easy publishing and deep archives), and see the collection as a touching whole piece. That is what you get at Good People Theatre (FB)’s production of Marry Me a Little at the 2015 Hollywood Fringe Festival (FB). 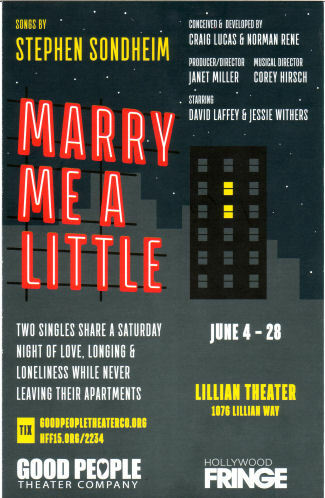 Marry Me a Little started as an off-off-Broadway piece in 1980, conceived by Craig Lucas and Norman Rene, drawing together music from Sondheim‘s then-unpublished Saturday Night, as well as songs cut from Company, Follies, A Little Night Music, Funny Thing…Forum, Anyone Can Whistle, and some even rarer shows. They were connected in a cycle that created a story of two singles in apartments in New York that were adjacent vertically. The story showed them both longing for love and imagining love with each other. Since the piece was published a number of the songs have become better known: Saturday Night has been recorded and released, Side by Side by Sondheim and a number of tribute albums have captured songs like Foxtrot, and the incessant explorations of Company have captured the many songs cut from that show. Still, Marry Me a Little remains a small easy to do show (and thus perfect for Fringe festivals :-)), with minimal requirements and lots of audience oomph. Good People Theatre, under the direction of Janet Miller (FB), was the perfect choice to bring this to the Fringe, having done a great job on other musicals. What particularly struck me watching this was that it didnt’ seem like a Fringe show. In other words, most of the other Fringe shows have that edgy feel to them — actors with minimal props using their imagination to do lots of different things, often frantically (because I like comedies). But this was… elegant. About the only way to improve it would be to import the grant piano from Closer Than Ever. It felt like the set was right and not improvised; it felt like the music was right and not rushed. This is the same feel that came from 2014’s Fantastik‘s and 2013’s Man of No Importance. This is why I particularly look forward to GPT’s productions at the Fringe (or anywhere else for that matter). The performances were great, both individually and together. Some general comments before I touch upon the individual actors (who are illustrated in the production still to the right). I particularly enjoyed that GPT did not cast the typical image of a Hollywood actor — thin and chisled and shaped. The actors in this show looked like real people, and that little, subtle touch made the show relatable and believable. This wasn’t an unobtainable couple, this was an everyperson couple. That was great. The two actors had remarkable chemistry together, which was clearly visible in songs like “So Many People” (from Saturday Night), “A Moment With You” (also from Saturday Night), and “Pour Le Sport” (from the unproduced The Last Resorts). The woman was played by Jessie Withers, who had a lovely operatic soprano voice. If you understand the difference between an operatic and a pop music voice, you’ll realize that I’m saying she had both wonderful controlled power and a purity of tone that was a joy to listen to. One of my favorite performances of hers was in “Can That Boy Foxtrot” (from Follies), where in addition to the voice she combined some wonderful little facial expressions and movements to bring the acting side to the fore. She was also particularly good on “Marry Me a Little” (from Company). The man was played by David Laffey (FB), who had a lovely what I would guess to be a tenor voice. It didn’t quite have the operatic power of Withers, but blended well with hers and was nice to listen to in his solo moments. Laffey was particularly good on “Uptown, Downtown” (from Follies), with some lovely dance moves. Music was provided by wonderful Corey Hirsch (FB) on an electronic keyboard; he had some great interactions with the characters that made him much more than just an onstage accompanist. As noted earlier, the scenic design by Robert Schroeder (FB) was simple and worked very well, making one forget this was a Fringe production. This was aided and abetted with the props from Good People Theatre (FB). The lighting by Katherine Barrett (FB) and appeared to be a combination of movers and programmable LED lights. These worked great for the Fringe (which often leaves productions stuck in terms of lights), and allowed the lights to enhance the mood. The costumes by Kathy Gillespie (FB) worked well on the characters. Other technical credits: Kimberly Fox, Marketing Director; Michael P. Wallot (FB), Marketing/Media Manager; Oliver Lan, Graphic Designer; Rebecca Schroeder (FB), Stage Manager. 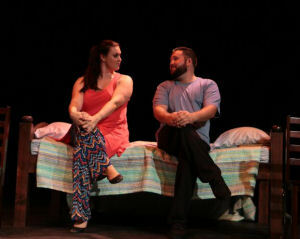 “Marry Me a Little” has 7 more performances at the Fringe, and it is well worth seeing. Tickets are available through the Fringe website, and may be available through Goldstar (some are already sold out). Upcoming Shows: Next weekend sees the craziness continue with the Nigerian Spam Scam Scam (HFF) at Theatre Asylum (FB) and Merely Players (HFF) at the Lounge Theatre (FB) on Saturday, and (on Sunday) The Count of Monte Cristo – The Musical (FB) (HFF) at the Lounge Theatre (FB) in the afternoon, and Uncle Impossible’s Funtime Variety & Ice Cream Social, (HFF) at the Complex Theatres (FB) in the evening. The Fringe craziness ends with Medium Size Me, (HFF) at the Complex Theatres (FB) on Thursday 6/25 and Might As Well Live: Stories By Dorothy Parker (HFF) at the Complex Theatres (FB) on Saturday. June ends with our annual drum corps show in Riverside on Sunday. July begins with “Murder for Two” at the Geffen Playhouse (FB) on July 3rd, and “Matilda” at the Ahmanson Theatre (FB) on July 4th. July 11th brings “Jesus Christ Superstar” at REP East (FB). The following weekend brings “The History Boys” at the Stella Adler Theatre (FB) on Saturday (Goldstar), and “Green Grow The Lilacs” at Theatricum Botanicum (FB) on Sunday. July 25th brings “Lombardi” at the Lonny Chapman Group Rep (FB), with the annual Operaworks show the next day. August starts with “As You Like It” at Theatricum Botanicum (FB), and is followed by the summer Mus-ique show, and “The Fabulous Lipitones” at The Colony Theatre (FB). After that we’ll need a vacation! As always, I’m keeping my eyes open for interesting productions mentioned on sites such as Bitter-Lemons, and Musicals in LA, as well as productions I see on Goldstar, LA Stage Tix, Plays411.